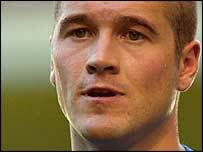 Burglars have raided the home of England and Tottenham Hotspur goalkeeper Paul Robinson. They stole some jewellery at the player's north-west London house on Sunday evening after smashing a window to get inside. The burglary happened just a day after the 25-year-old played in England's 1-0 win over Wales in a World Cup qualifier in Cardiff. His wife Rebecca and daughter Lucy May were not at home at the time. The Spurs star returned home to deal with the aftermath of the raid, before rejoining his England colleagues at their hotel near St Albans, Hertfordshire, on Sunday night. He was then given a lie-in on Monday morning by England coach Sven-Goran Eriksson. The player is expected to fly out to Belfast with the rest of the squad for Wednesday's World Cup qualifier against Northern Ireland. Robinson's agent, Robert Segal, said it appeared to have been just a chance burglary. "They smashed a window, took some bits and then ran out," he said. "Apparently there have been a spate of burglaries in the area. Nobody was in the house at the time." Mr Segal said it was not clear exactly what had been stolen, but confirmed that some jewellery had been taken.